Create your own custom-made scarf, for your club, society or business, simply using the colours you like just for you. All of our scarves are made from fine 100% Saxony wool cloth. All scarves are approximately 6ft (1.83m) long and have our own Ryder & Amies Made in England label sewn into the bottom corner. Using the colour picker, select colour 1, select colour 2 and continue until your pattern is complete. When you are happy with your colour choices and pattern add the number of scarves into your basket and check out. Please upload your logo in png or jpg format, 2Mb file limit. A png file will show as an overlay image on your scarf. Logo must be in required embroidery colours. Minimum 10 scarves required. We have a selection of 20 colours to choose from. We use only 100% Saxony wool cloth which is manufactured and dyed in the UK. 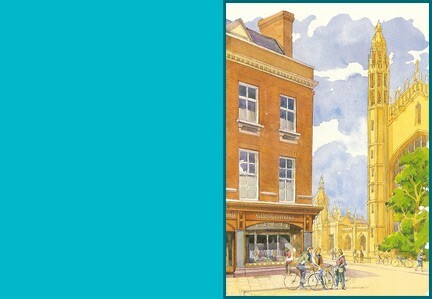 Each colour is appropriately named using the names of the Colleges of the University of Cambridge (with the exception of one – do you know which one?). The colours shown are a representation of the fabric we use and whilst we have tried to match the colour of the cloth to the colour you see on screen, please allow for slight variations due to different quality monitors/screens. 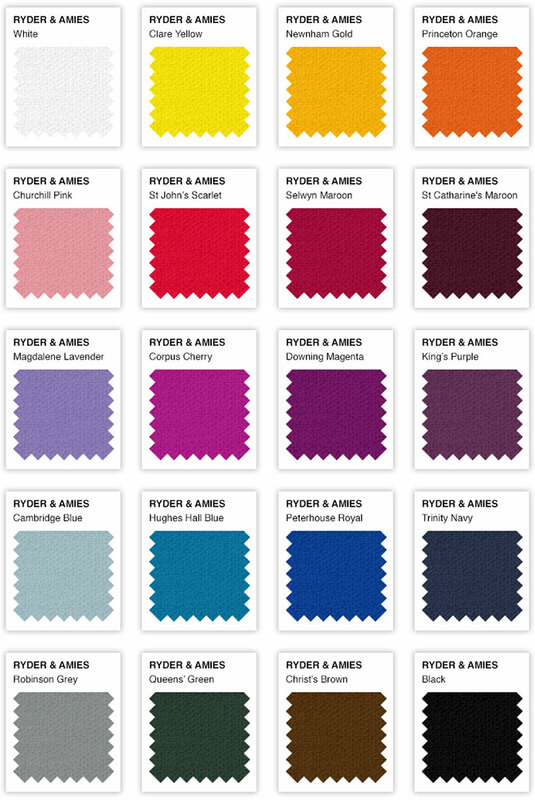 If you would like any assistance or guidance on colours or patterns please contact carrie@ryderamies.co.uk who will be pleased to try and assist. The pattern guide below gives an approximate indication of stripe width for each stripe. All scarves are individually handmade by our talented team of seamstresses and sewers and all measurements are approximate. Create your own custom-made scarf, for your club, society or simply using the colours you like just for you. All of our scarves are made from fine 100% Saxony wool cloth, the cloth is manufactured and dyed in England. We manufacture the scarves in our small work room, with a talented team of seamstresses and sewers in Fenland, Cambridgeshire. All scarves are approximately 6ft (1.83m) long and are beautifully finished with our own Ryder & Amies, Made in England label sewn into the bottom corner. Simply select the pattern you like from the choice of six (A-F) and then choose one of the 20 colours for each one of the numbered sections on your pattern. Click on the down arrow in each stripe and select your colour on our Colour Picker. Continue until your colours are complete. 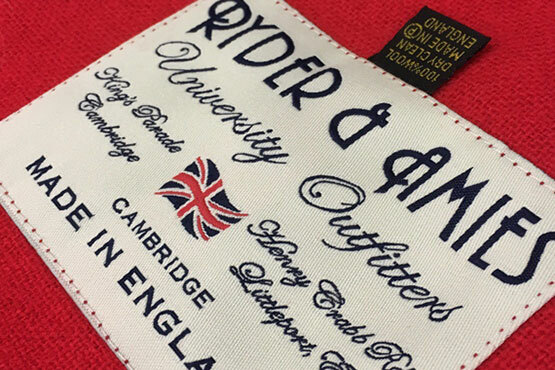 We have a selection of 20 colour fabrics you can chose from, the names of the fabrics are colours used by Colleges of the University of Cambridge, with the exception of Princeton Orange, which is not used by the Cambridge University at all. The colours shown are a representation of the fabric we use and whilst we have matched the cloth to the colour you see on screen this may not be an exact match considering colour and texture of the fabric and the screen you are viewing on. Custom made scarves are individually priced from £35.00, although clubs, societies and businesses wishing to order 10 or more of the same design are given a 15% discount. On orders of 10 or more scarves we offer an additional service, we can embroider your scarves with a logo of your choice. A surcharge of £5 per scarf is applicable. The logo image needs to be less than 2mb and in .jpg or .png format. The logo MUST be in the required embroidery colours. We reserve the right to reject any logo, which in our professional opinion will not produce a good result. It is our standard practice to embroider the logo/crest in the centre at the base of one end of the scarf. Logo positioning on screen gives an approximate idea of look and may differ from the final embroidered result. Individual scarves can normally be produced and dispatched to the customer within one week. For orders of ten or more scarves please contact carrie@ryderamies.co.uk for delivery timescales as these can vary. Our standard postage charges apply alternatively, you can collect from store free. We are sure you will be delighted with your scarf/scarves. As these are bespoke, made to order to your specification please note that they are non-refundable items. We hope you will find Create Your Scarf simple and easy to use, however, if you get into any difficulty or have a query regarding this then please contact carrie@ryderamies.co.uk who will be pleased to try and help. We’d love to see you wearing your scarf or to see our scarves being worn by groups, rugby teams, choirs, lawyers, schools, please feel free to share your images on our Instagram (@ryderandamies) or Facebook Pages (@ryderandamies).